Home > Marking and protecting your property against Theft. Marking and protecting your property against Theft. Hi, we at GC Law are concerned about safety and security on the Gold Coast, and we hope over the coming months through our latest news page, we will provide you with helpful information on staying safe and making sure your property and belongings are protected against theft. Crime on the Gold Coast unfortunately has been on the increase, and we hope the following article with some very simple tips will help to keep your valuables safe. • Deters theft as marked property is more difficult for the thief to offload. • Marked property helps police to identify and return it to the rightful owner. Property that is most at risk of being stolen is property that is desirable, usually small, has a good re-sale value and is able to be off loaded and sold quickly. Typically, this includes computers, cameras, multi-media devices, satellite navigation devices, mobile phones, power tools and bicycles. • Mark your property by engraving or microdoting them. Where possible, mark your property with a code on the top right hand rear corner of the item or near to the manufactures serial number. Take a video or photograph of property that can’t be marked, such as jewellery. Go to our checklist for a list of items you should consider marking. • After marking your property, visit your local police station, police beat shopfront or neighbourhood police beat and tell them your code. You can also collect ID warning stickers to place on your engraved items and on your doors or windows to act as a deterrent to would-be intruders. • Keep accurate records. 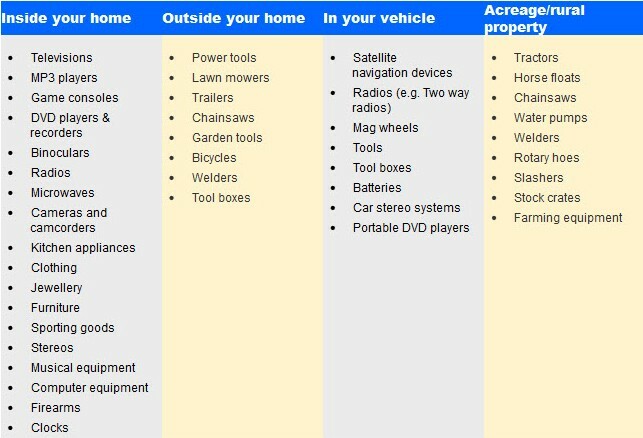 Write an inventory as this will help you make an insurance claim and assist police recover stolen items. List the serial, make and model numbers and keep the original receipts of valuable items and store this information along with any valuation certificates in a safe place. Engravers are available for loan from your local police station, police beat shopfront, neighbourhood police beat or Neighbourhood Watch Area Coordinator (at no cost). You should seek operating advice before using an engraver as not all items are suitable for engraving. Property identification involves marking your property with a personal code. The Queensland Police Service recommends you create a personal code. Microdots are micro labels, about the size of a grain of sand, which are engraved with a unique identifying code which is invisible to the naked eye. The dots are applied with an aerosol can or cotton bud using a clear water based adhesive which also contains a UV trace to assist police to detect the location of microdots. Brisbane residents may be eligible for Brisbane City Council’s ‘Microdot Property Identification Subsidy Program’ which provides kits at a subsidised rate. Kits are also available from Police Citizens Youth Club (PCYC) branches across Queensland and from a variety of retailers. Jewellery, watches, antiques, silverware, paintings, collectables and stamp and coin collections should be photographed or videotaped, with a ruler or matchbox beside them to assist in determining size. Always keep photographs, DVDs, negatives and credit card dockets or receipts with your property list to help with identification and insurance claims. At GC LAW helping people is not just a saying it’s what we do. We help ordinary people stand up for their rights when things have taken a turn for the worse. We can help assess your claim today.